Things that I changed: The only thing that I did differently was serve them about a half hour after they came out of the oven. It says to chill in the fridge for 2-3 hours. There was no way the guys we had over here, smelling them cook would wait a second longer. They were fine serving them that soon. Things I would do differently next time: Nothing at all! Will I make these again? Heck yes! Cream butter, sugar and vanilla. Add one egg in at a time. Mix in cocoa, flour and baking powder. Beat until smooth. Split the bag of reeses in half. You will use half the bag in the brownie batter and half the bag for the frosting. Cut the reeses into four pieces and mix into the batter. Bake at 350 degrees for 20 to 30 minutes in a 9 x 13 inch greased pan. Do NOT over bake. Allow brownies to cool for one hour. For the frosting beat together the cream cheese, sweet condensed milk and vanilla. Beat for 2 minutes. Spread on top of the brownies. Sprinkle the remaining reese’s on top and refrigerate for 2-3 hours before serving. Hi Alyssa! Thanks for leaving such a nice comment on my blog. I’m so excited you left me your blog address, I am always on the hunt for new recipe blogs. I love the way you have your blog set up in review format, so clever, and so helpful. 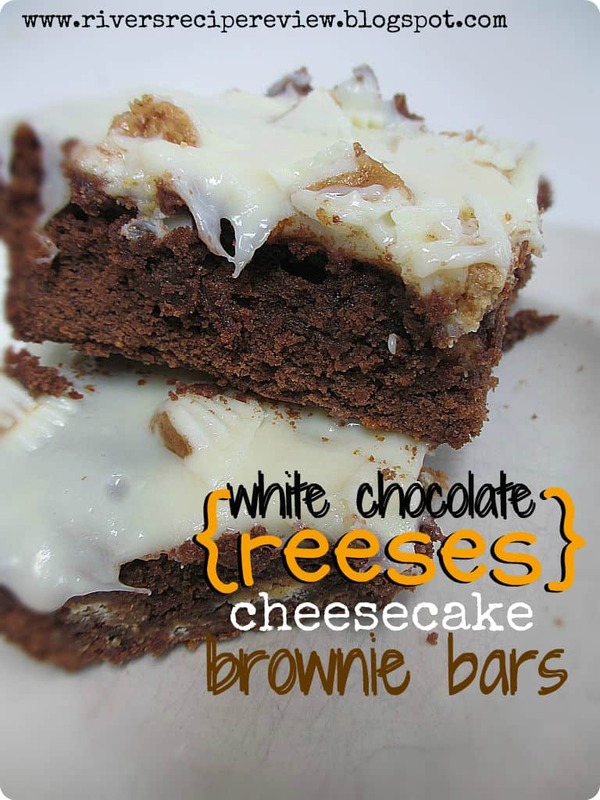 I can’t wait to make these brownie bars! what size can of sweet condensed milk?